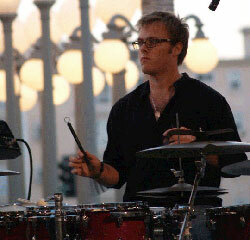 Zach Harmon was born into a musical family in Wisconsin. He began studying classical piano at the age of four and continued for twelve years. He was principal chair percussionist for most of his five-year stay with the Oshkosh Youth Symphony Orchestra before becoming a member of the Wisconsin State Honors Orchestra in 2002. In 2003, Zach became a member of the Clifford Brown/Stan Getz All-Stars with whom he toured Japan and performed at the 2003 Monterey Jazz Festival. Also in 2003, Zach enrolled in the Thornton School of Music at USC where he studied with the great Terri Lyne Carrington for two years. After his sophomore year, he transferred to the Masters program at the Thelonious Monk Institute of Jazz where he studied under the tutelage of many of the great masters of Jazz. In 2005, asa member of the Monk Institute, he toured with Jazz legends Wayne Shorter and Herbie Hancock performing in a cultural mission through Vietnam. In 2007, he toured again with Mr. Shorter and Mr. Hancock, this time throughout India. Zach has been studying tabla with Abhiman Kaushal for several years and recorded tabla on Terence Blanchard’s *A Tale of God’s Will* for Blue Note Records; he is now a Grammy award-winner for contributing to this album dedicated to the events of Hurricane Katrina.